*Apply the fresh herb, washed, directly onto sores, closed eyes, wounds. or *Cook the greens and stalks, especially when using older plants or treating deeply; cool somewhat before applying. or *Simmer chickweed in half water, half vinegar for about five minutes, cool and apply. Poultices used on infections, such as pinkeye, must be thrown away after use. 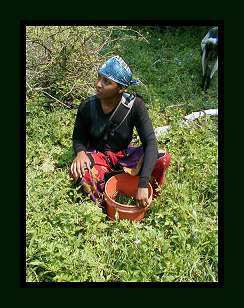 Poultices used on cleanwounds and unbroken skin can be reused several times if chickweed is in short supply. If you are curious about herbal medicine and want to learn more, this collection for you! These four books by noted herbalists will teach you how to grow, wild craft, buy, prepare, and use herbs for health, beauty, and fun. All four purchased seperately are a $56.00 value (plus shipping), YOURS for only $45.00 (plus shipping). Order this collection today to begin your herbal journey. Enrollment limited to ten women. 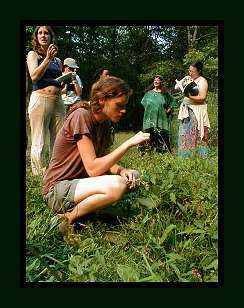 Two one-week apprenticeships for aspiring herbalists who want to learn from and play with the Green Goddess. And for past apprentices to share their wisdom and knowledge. Here in the safety of the Wise Woman Center we will play with the fairies, dance with the devas, sing with the stars, and reweave the healing cloak of the Ancients. We hope you can join us! The fee includes all meals, lodging, instruction, textbooks, and supplies. 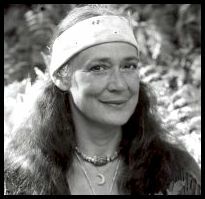 Your Green Goddess Apprentice week begins at noon on Monday and ends about 4pm on Sunday. You may arrive as early as 11am if you wish to settle in first. If you are flying in, please check with us about options for arriving early or staying later. There is a $5 pickup fee to get you from the bus in Woodstock or Saugerties. Our days begin with breakfast (out from 8:30 until 9:30), followed by class (10am - 1pm), then lunch and talking stick (1:30 - 3:30), afternoon class (3:30 - 6pm), dinner (6:30 - 8pm), and finally evening campfire circle of stories and songs (8pm - 10pm). On Monday, we will choose our goddess archetypes and our green allies and pick a wild salad for an early dinner. On Friday, we will also eat one hour earlier since the moonlodge starts at 7pm. On Sunday, we will have a lavish high magic ceremony followed by a late lunch and a final talking stick. Many surprises await us on all the days in between. Please send your name, age, address, phone number, e-mail address, and letter of application (words or images) with your $100 deposit -- which will be returned if we cannot accept your application. A color photograph is helpful if you can include one. Tell us which week you wish to attend and whether or not you could come to the other week if your first choice is full. Payment for this event may be made in installments charged to your credit card. 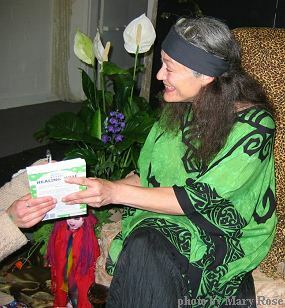 All Green Goddess Apprentices must be paid in full ten days prior to their arrival. There are three work-study positions open at each Green Goddess Week. Each position requires 50 hours of work over an eight day span (the seven days of the green goddess week plus the day before it begins or the day after it ends) plus a payment of $500. You will not miss any class time if you do work exchange; you will be busy from 8am to midnight. To apply for one of these positions, please write. Tell us of your willingness to work and your desire to participate. You may use work-exchange credits from any work exchange weekend toward this event. We will accept ten students in this program, plus three work-exchange students, plus apprentices who may be here already as well as visiting apprentices. Please register early.